Wendy and her friend Roland explore the attic of the nightmarish Escher monstrosity her home has become. 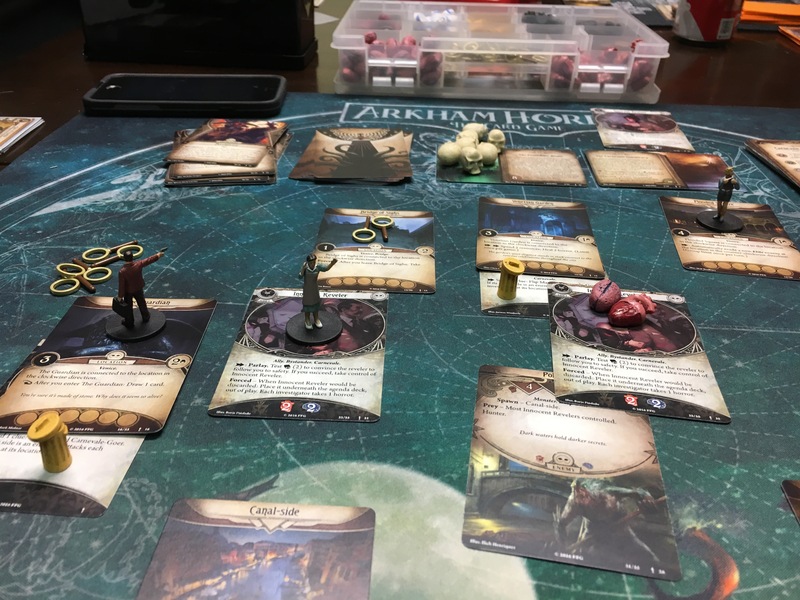 At the risk of excess melodrama, the Arkham Horror card game has been a bit of a light at the end of the tunnel for me. Fall’s traditionally a busy time of year for me, with both Carnage in the offing and my professional commitments. Once it was pretty clear that the game would be available November 10th, I wanted to make a point to get the first game in as soon as possible. Usually, I get a game and it takes two or more months to get some people together to play it, especially in November as we’re all wiped from Carnage and the holidays are ramping up. So I was pretty happy that my friend Tom was free last night and interested enough to give the game a try. Three and a half hours from purchase to play is probably a new record for me. The first session is always a learning experience. Fantasy Flight’s new model of a short rulebook and a longer, encyclopedia-style volume of rules concepts worked pretty well. The short Learn to Play rulebook basically walks you through setting up and playing the introductory scenario. I noticed what seemed to be some discrepancies in card names and numbers when assembling the encounter deck, so I think that may have affected this particular session, since not every ghoul made it into the encounter deck. Like Netrunner, Arkham has an action economy. Each investigator can do three things on their turn, selected from a list of choices, including things like draw a card, gain a resource, investigate a location and so on. Figuring out the efficiencies of the game — when and how is it best to gain resources, for instance — is going to be one of the first steps to being a better player. In this first session, Tom and I took the approach of pushing through the investigators’ act cards as quickly as we could, reasoning that the advancement of the agenda would only make ours lives more difficult. In retrospect and without divulging spoilers, that may not have been the best choice, as it meant we didn’t spend time exploring every location or drawing useful cards from our decks. On first blush, I like the way the game plays. It has an elegance that comes from how both Netrunner and Eldritch Horror mapped mechanics to their respective themes. It’s very role-playing game-like, with unexpected developments built into a scenario and not necessarily loss conditions, but “worst result” situations. I’m a little concerned that there’s not a lot of meaningful replay value in an individual scenario, unless one enjoys taking every possible character configuration — now Wendy armed for combat, and then Roland as a hyper-investigator, and how about Daisy with guns! — through the story line, which reminds me an awful lot of grinding characters through certain entries in the Final Fantasy console franchise, or playing against progressively higher difficulty settings. The flip side of that is Fantasy Flight has a steady stream of expansion products planned that I may never have time or inclination to go back to the core box scenarios, unless I’m teaching the game to newcomers. Netrunner certainly taught me that one new product every month will challenge my ability to squeeze in both modifying decks to take advantage of new investigator cards and carving out times with friends to play through the new scenarios. 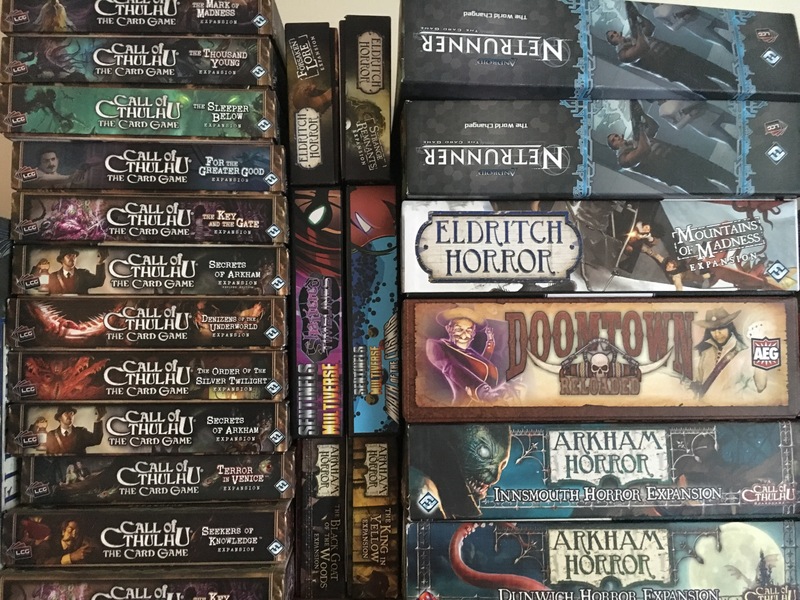 Deckbuilding in Arkham is less onerous than Netrunner, happily, as it’s a single 30 card deck and players don’t develop a new list for league night every week. And I’m curious to see how deckbuilding works out over the course of a campaign. If people play the scenarios as they’re released, rather than waiting until the full cycle’s worth of cards are available, how many of them are going to utilize the rules for paying to swap cards in and out? Going into this one-shot, the accounts were it was a long slog due to no high damage dealers on the team, so I opted against recording it. As it happened, the game went on for so long that I paused it overnight and came back to finish during lunch the next day. Too much of the early game was spent playing defensively. I had the Adept using Counterpoint Bulwark repeatedly to make everyone resistant to zombies, or having Legacy double-tap Next Evolution to ward off the most common forms of villain damage, cycling among melee, toxic and infernal. Guise was doing most of the damage, largely the plinky sort. Somewhere I got off track from defending effectively and things spiraled downward for Guise after that. Once the team was down to the Adept and Legacy, I spent a lot of time turtling by letting the Adept take the hits and heal back up with Inspiring Supertonic, or getting Backfist Strikes back from the trash. My big takeaway from this game is having experimented with bouncing power uses between America’s Greatest Legacy and the Adept effectively. Send a power use over to Legacy with the Supertonic and have him send it right back with Gung Ho for a free hit point. Also, have Legacy use Gung Ho on himself when he’s low on health, too! This was probably the first game I used Cedistic Dissonant repeatedly. With Instrumental Conjurations to burn, it hurt a lot less to give up an instrument, especially when the reward is removing any destructible card from play, such as Anubis or any number of environmental annoyances pouring out from the god’s tomb.